Technical Analysis Of JAKS : Should You Invest In This Stock? JAKS is still in a very nice daily uptrend and it recently was able to overcome an old high. Since the trend is still up, the bias for this stock is still bullish. I will first of all show you the monthly chart of this stock so you will know the big picture of what is happening to this stock in the long term. 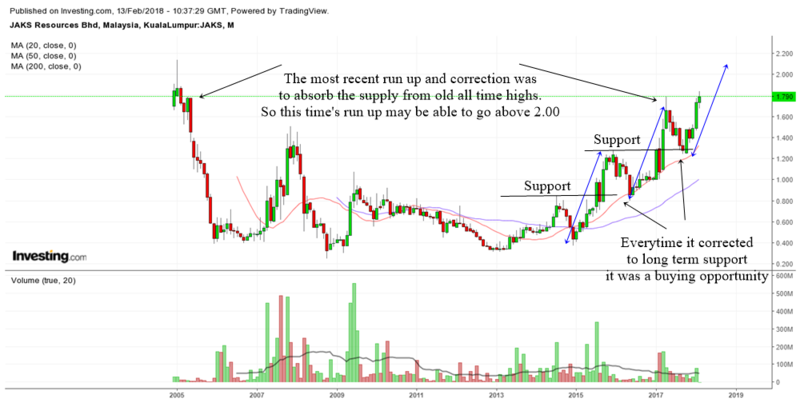 The chart above is the monthly chart of JAKS. As you can see, the stock has gone downhill after it first traded back in 2005. Notice the topping tail? It always amazes me how the topping tail can hint of a fall. In fact I would categorize this as a monthly super topping tail. The stock has been going up and down since 2007 and it was only in 2015 onward it gave a meaningful uptrend. At this moment, JAKS is still in a very nice monthly uptrend. When a stock is in a long term uptrend, every dip and correction is a buying opportunity to purchase the stock. But whether you have the guts to keep on buying JAKS in a devastating correction will depend on your conviction on the stock. To invest a huge sum of money into a stock you need to have understanding of the company's story and fundamentals. Fundamental analysis gives you the conviction to put in RM Million, RM Million or even RM 50 Million into a stock but it is technical analysis that will aid you in getting the best price possible. From the chart above, I would like to show you the blue lines I have drawn. They are what technicians call a measured move. A measured move takes the height of the previous run up before a correction and extrapolate it upwards from the base of the current run up to get a realistic target. From the measured move, we get a possible target of above 2.00 for JAKS. That is also where the former all time highs for this stock is at. What is interesting about this stock is that every time it corrected to a support area, it bounced up and moved higher. Well, as they say, when a stock falls to a support area, it is always a good time to consider buying. I will show you another interesting thing about JAKS in the weekly chart later. The recent run up before the current one actually declined because it hit a resistance area set back in 2005. 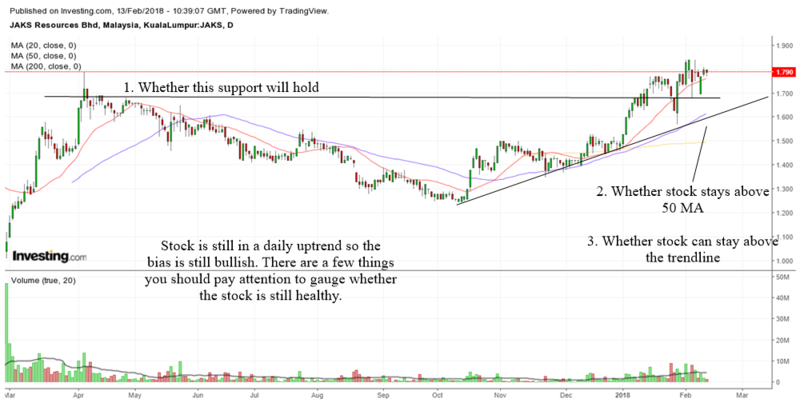 This helped to absorb supply from there and if the uptrend in the daily chart continues, then it is very possible for JAKS to go above 2.00 and perhaps higher and stamp a new all time high in the stock's trading history. The chart above shows the weekly chart of JAKS. What is interesting about this stock is that all of the past 3 corrections had ended by forming some type of weekly ascending triangle bottom. So it is really beneficial to learn a thing or two about chart patterns. 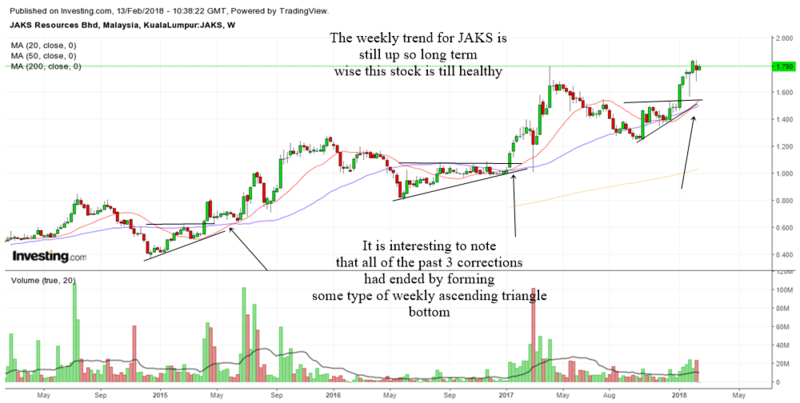 The weekly chart of JAKS is still in a nice uptrend so therefore the investor should continue to remain bullish on JAKS for the long term. Now, we will zoom into the daily chart of JAKS. If you are interested to invest in this stock... well you should have got in right at the bottom. Astute investors or traders get in at the bottom or the middle. Anyway for those who are interested to invest in this stock, you need to be on the lookout for 3 things. Those are technical triggers that hints to us the mid term health of this stock. As long as these 3 criterias are still valid then it is very possible that JAKS will continue to rise.